Steve Strank - Hero and Protector in and out of Cosplay! Cosplay is as much about dressing up as super heroes as it is about being a hero as well. 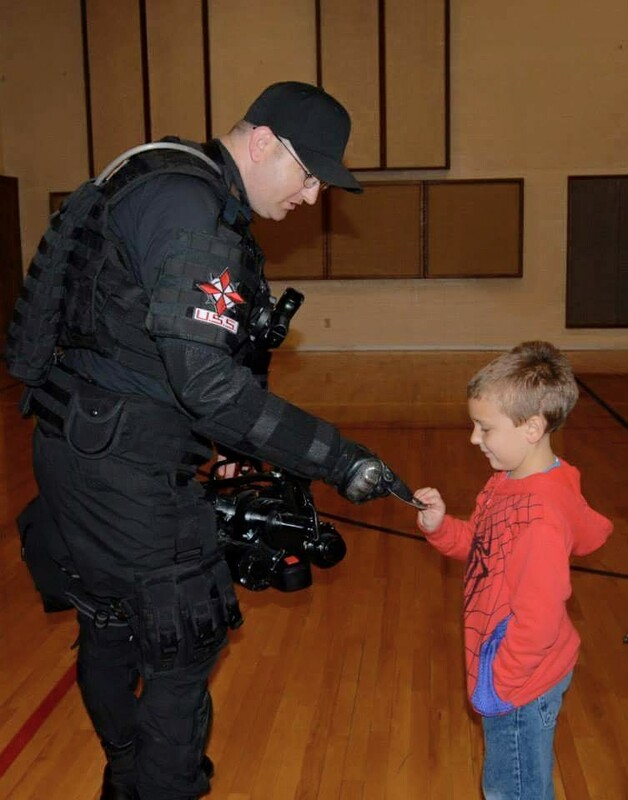 There are many charity groups in Utah and the United States that dedicate their craft to making a child's day or helping a donation event. Steve Strank is both a hero in cosplay and out! 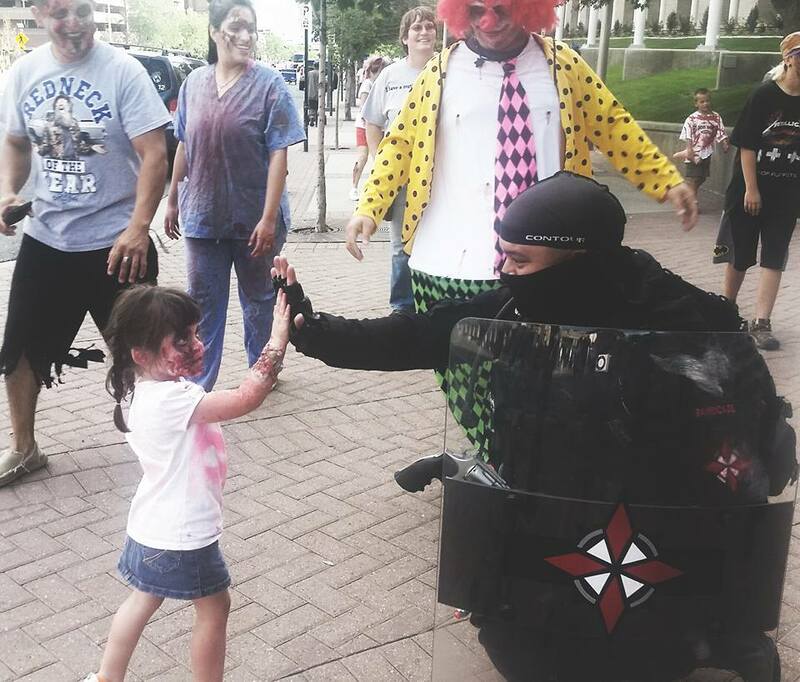 If you are ever in a bind, you can rely on any of the Umbrella Corporation members to help you out. They stand for fun, charity, and courtesy to everyone around them. How long have you been cosplaying and who/what got you into it? I've been dressing up for about 8 years. 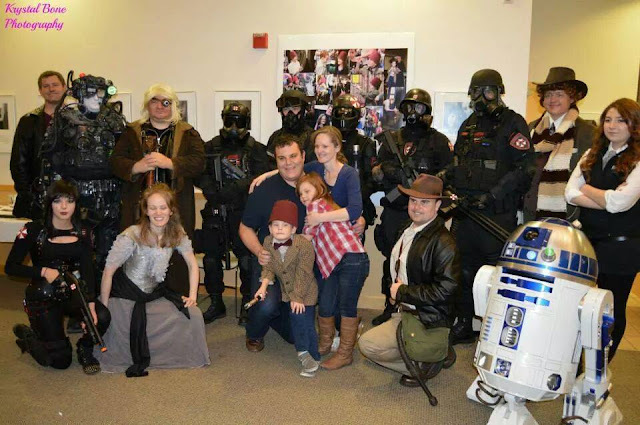 it started out as being a zombie back when we were producing Strankenstein's Zombie Prom, then I started dressing as the Grinch doing charity stuff. 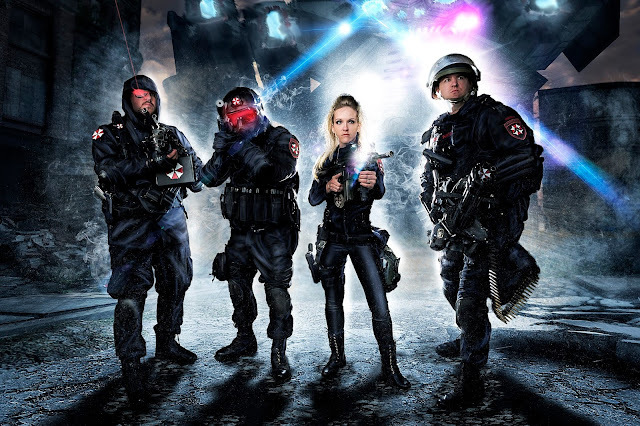 the Zombie stuff turned into dressing as a zombie hunter, which then morphed into creating The Umbrella Corporation - Utah Hive. Steve rocking the Umbrella Corp with his gear. Are you a crafter or buyer, or a mixture of both? Having a background in Special Effects and Prop making, I like to make as many of the props I use as I can for our sets and costumes. 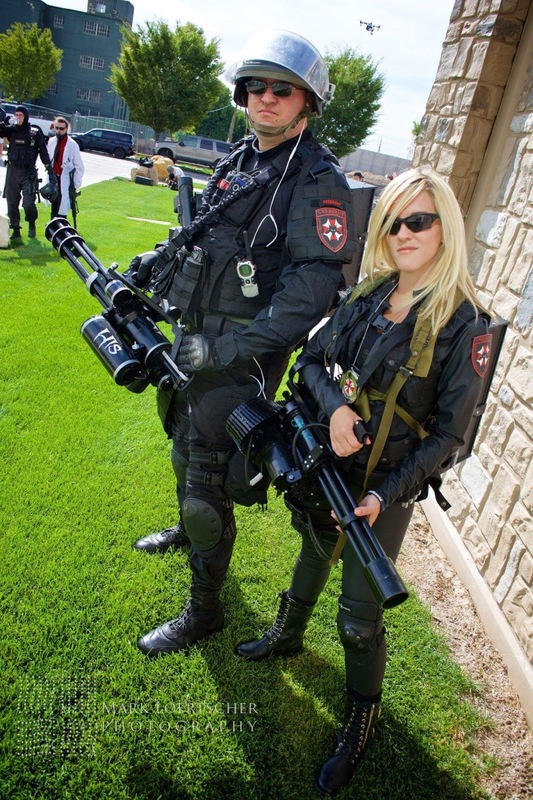 As for the costume I usually wear, working in Law Enforcement I like to have the Real Deal gear that I can use even when I'm not cosplaying. Its a little more expensive, but holds up to much more abuse. What do you cosplay for? It started out as fun, but as with everything else I do, if we can turn it into a charitable thing, let's do that! Since a large chunk of our group are Law Enforcement Officers, we decided our main charity would be for the National Law Enforcement Officers Memorial Fund. 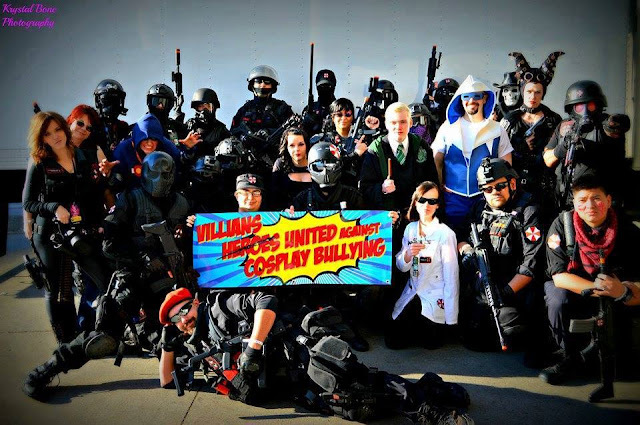 Umbrella Crop fighting against bullying! You work in Law Enforcement? What drew you to that career? I have worked in various Law enforcement positions, I'm not sure what it is that draws me to the field. I've just always been a protector and don't want to see innocent people get hurt. Steve encouraging a young hero. 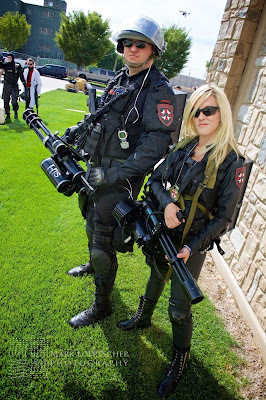 Tell me more about the Umbrella Corporation - Utah Hive and the Law Enforcement individuals that help volunteer for it. How was it founded and what are its core values? The Umbrella corporation group has many Law Enforcement officers involved. The group was started by Law Enforcement officers and like minded individuals. You don't have to be a officer to join, but you have to share our ideals which include charity work, encouraging other groups and individuals, always being helpful at conventions and just being courteous overall. Our group prides ourselves on being the "go-to" group if you need assistance with anything. Can you tell me about your favorite moment working with the Umbrella Corporation? I have too many favorite moments with this group. most of my favorites involve charity work we have done for children. And we never forget them. I follow the progress of every child we have done an event for and share with their family's triumphs as well as heart aches. That's what it is all about for me. Making a difference, even if its just a small one. "Making a difference, even if its just a small one." Thank you Steve for sharing your passion for charity and helping others. You can also find Steve's cosplay tip in the Utah Geek Magazine (Link). Thanks for reading!